I’ve got a tutorial for you today, which is something that I haven’t done in a while! I love the feeling of modern and rustic blend that an iron and wooden coffee table gives. The problem is that they are all rather pricey. Did I mention I just graduated college? That means I don’t have a ton of money to throw around on coffee tables. Ikea on the other hand, is something I can be enthusiastic about. 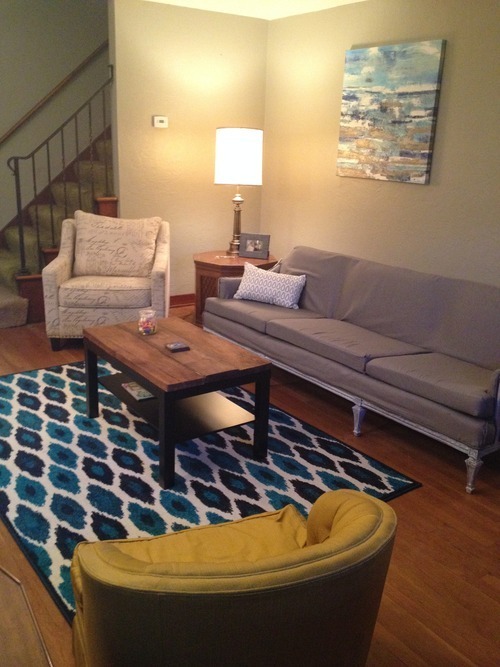 We picked up this great coffee table there for under $20. 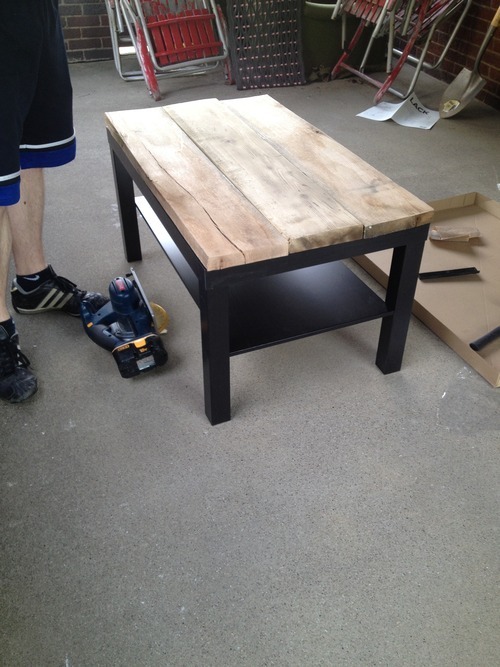 They had a real iron coffee table for a little more, however Aaron wanted something sturdier for adding the wooden top too. I just wanted the general idea/look of a wooden and iron table, so I agreed on the composite, dark table. 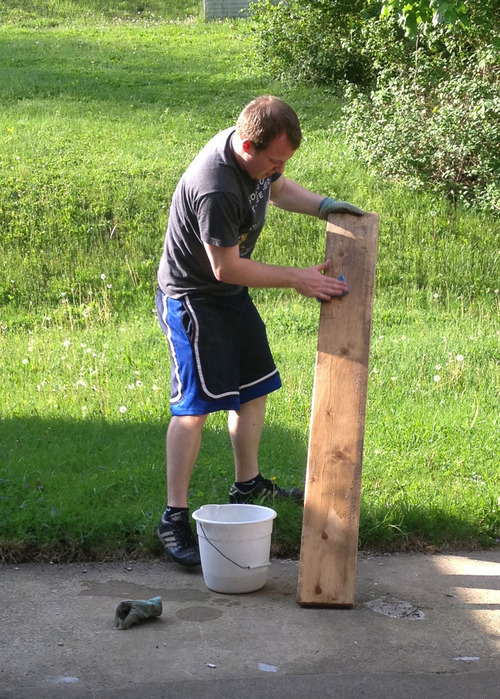 Wash and prep the wood. We loved all the character of the pieces we picked up, but they were super dirty. We washed and sanded each piece to get them ready to attach. Make sure they are completely dry before trying to cut them. My helper is the best! The $30 hand sander was the best purchase ever. Makes projects so much easier! 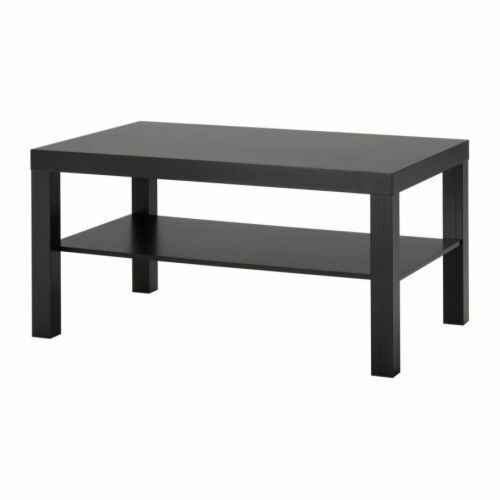 Assemble the Ikea Lack table. I followed the instructions up until the last step of attaching the bottom tier. I saved that for after the wood was attached so it would be easier to get under the table. Measure and cut your wood. The table top is 35 inches. 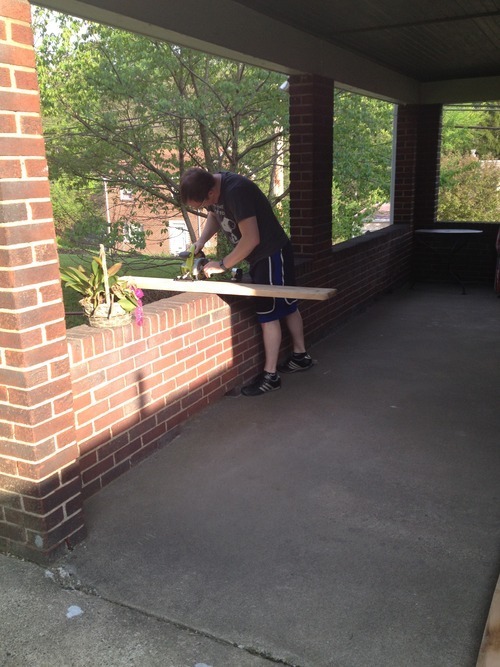 I wanted a tiny bit of over hang, so using the circular saw, we cut each piece at 36.5 inches. I am not a fan of blades/saws so I stayed very far away for this step. Have I mentioned he’s the best? If you don’t have access to a saw/cutting device, I know that most hardware stores like Lowes will cut wood for a small fee. Renting tools is also an option. 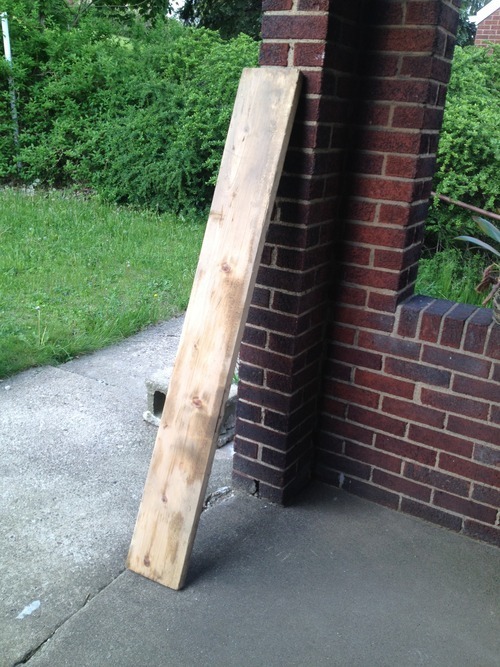 Place your planks where you want them on the table. It took a little bit of puzzle work and flipping pieces to make them look just right. 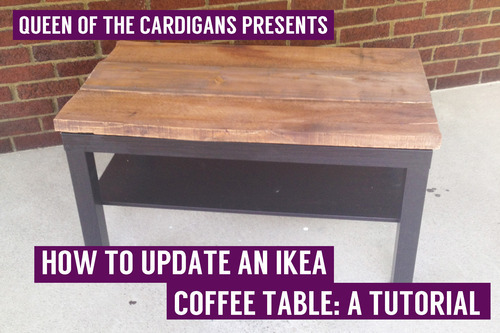 Attach your wood to the table using the screws. 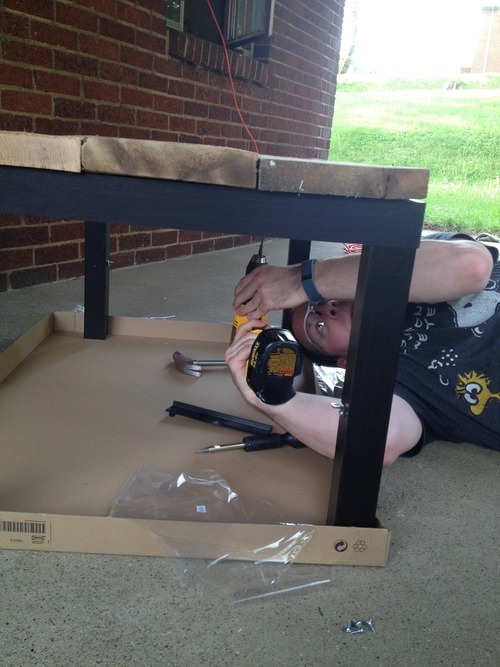 Aaron went underneath the table to screw them in from the bottom, while I held each plank in place. 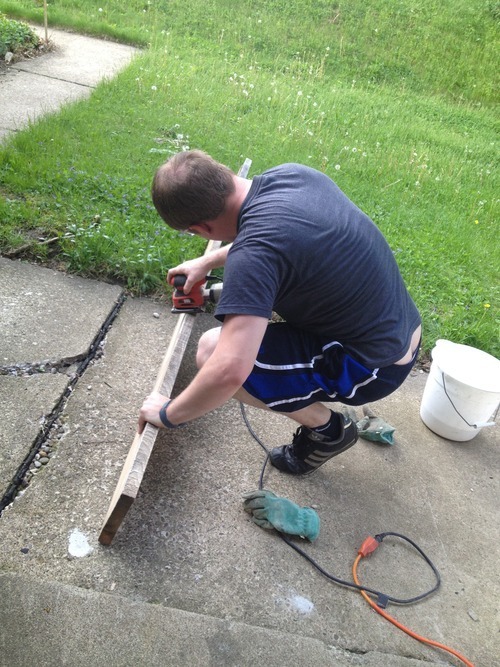 We used three 3” screws on each plank, one towards each end of the table and one in the middle of the plank. 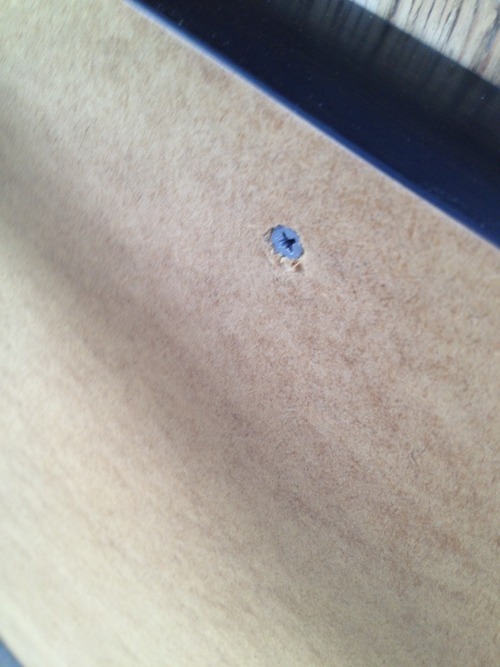 Be careful when drilling in the screws, because if you push too hard, the composite splits a little. 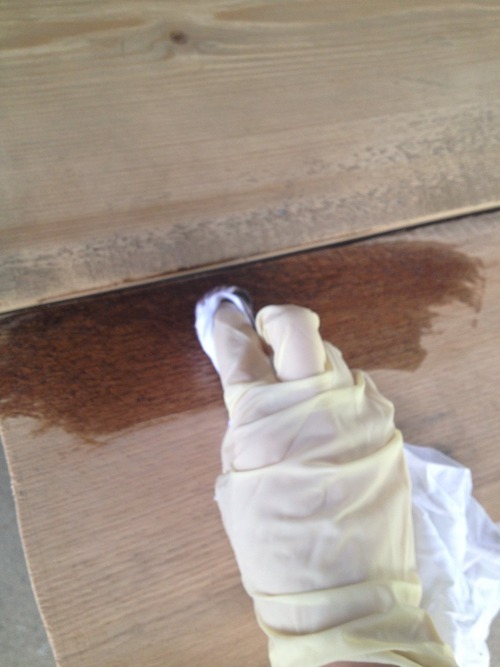 Sand off any splinters, especially on the ends where the planks were cut. 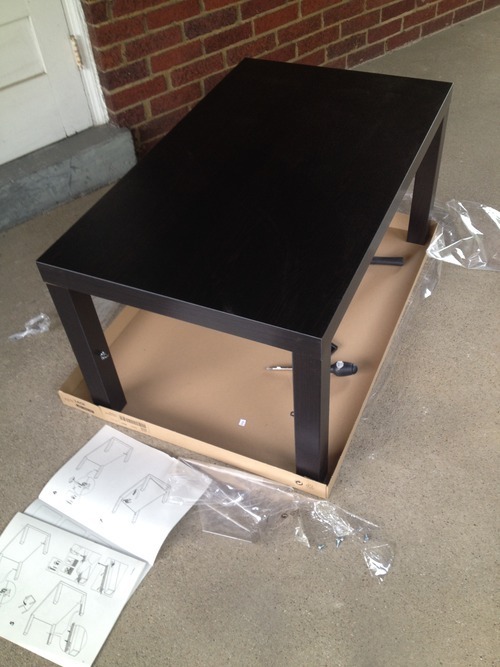 Then attach the bottom tier of the table per the Ikea instructions. Can you tell that’s my “project doing” shirt? I’m only wearing it in every other post. Apply a stain (if needed.) We both agreed the top was a little lighter than we wanted. 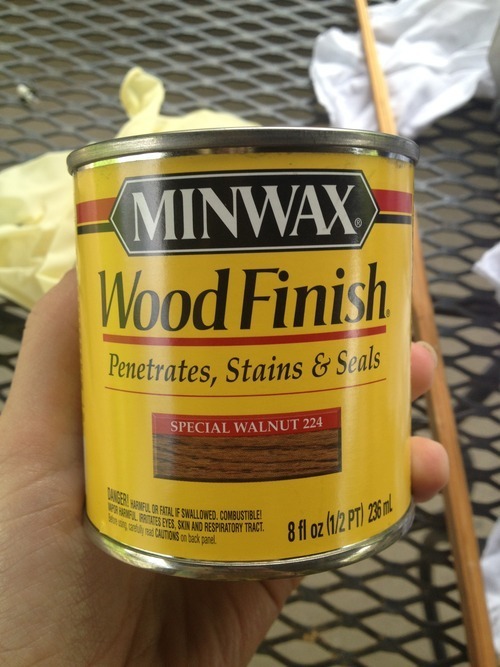 We chose Minwax Wood Finish stain in shade “Special Walnut 224.” Application was easy, just rubbed it on with a rag in the direction of the grain and let it soak in for about 5 minutes before rubbing the excess off. It was less than $5 at Lowes for a small can and it was the perfect shade with only one coat. All the character of the wood still showed through, which is why we chose those planks in the first place. 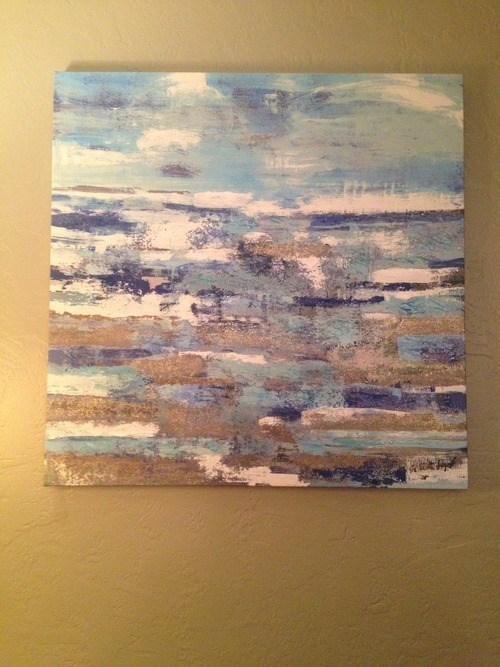 Let it dry and bring it inside to enjoy! 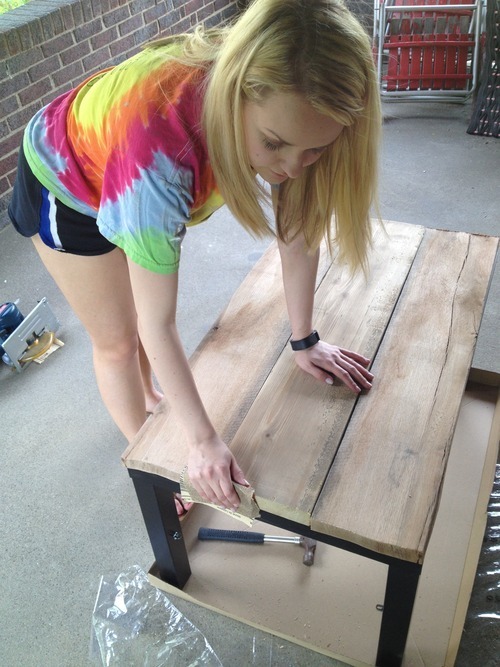 The only downside to this project was how much heavier the table became once the planks were attached. It’s pretty difficult for me to lift it. We had everything else like the screws and the saw. 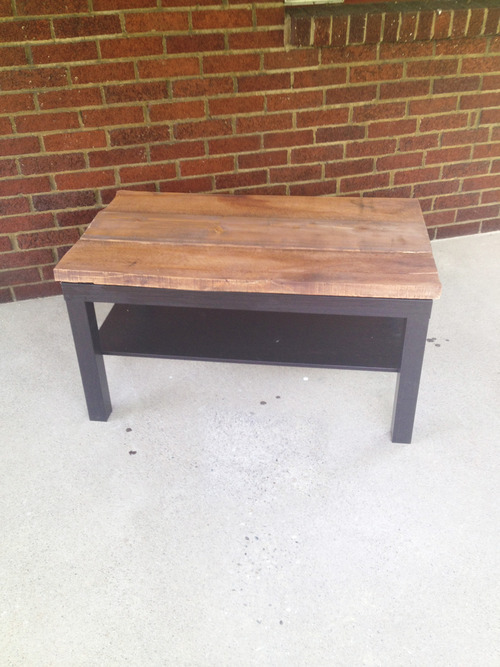 Restoration Hardware has a few similar tables for well over $500! Can you tell I love their stuff? I love a bargain even more. In addition to the coffee table, we’ve made some other changes to the living room to make it more homey since I posted about the paint job. 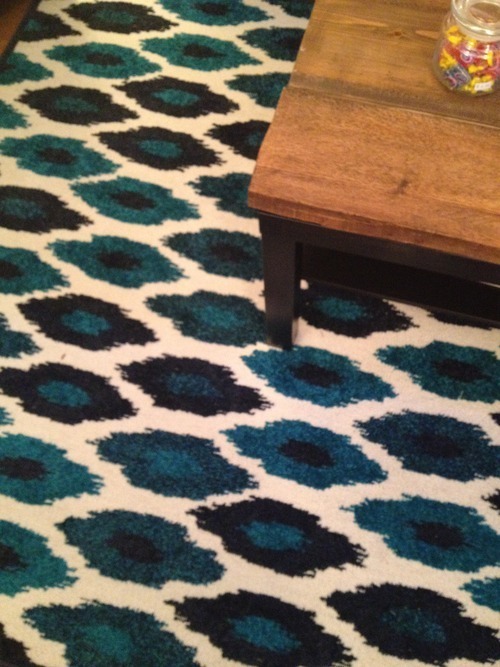 The new rug and canvas from Home Goods (another store I am obsessed with) bring the room some much needed color. 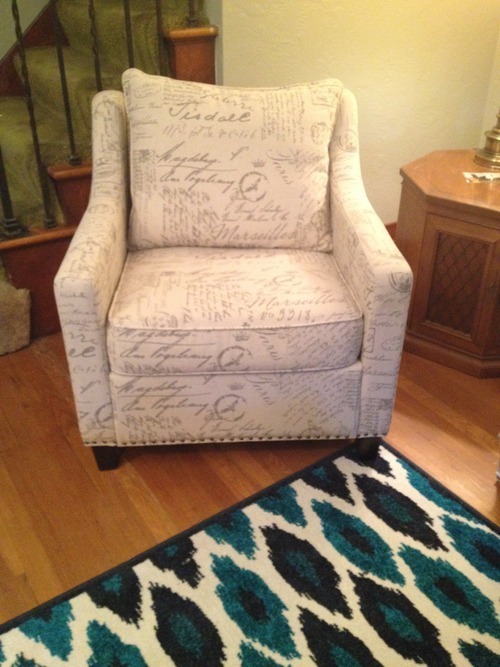 The accent chair was a steal from my bedroom at my parent’s house that I added after Ipainted it last year. Another Home Goods find! We brought Aaron’s piano down from the spare bedroom and added some frames and candles all around to personalize the space. 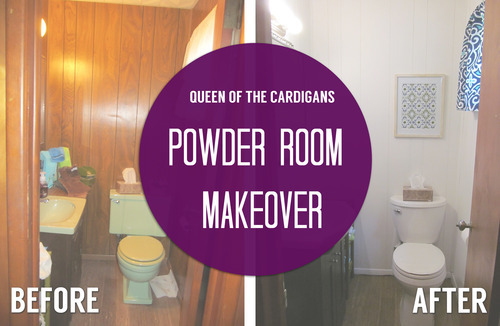 Right off of our awesome, new kitchen, there is a small powder room that needed a major makeover. Our house was built in 1943, however this powder room is part of an addition that was put on in the early 1970s. 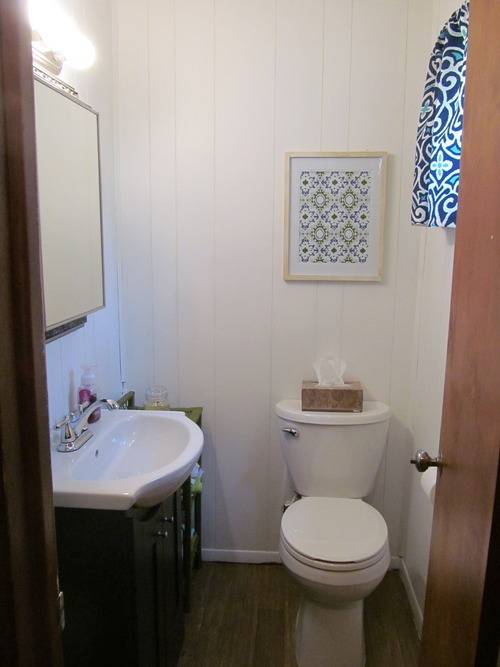 So yes, there is wood paneling in both the powder room and the family room next to it (that’s a makeover for a different week.) 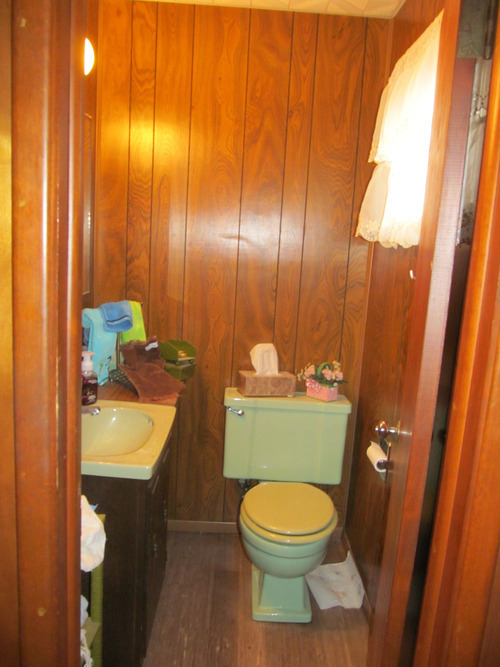 In addition to the stylish paneling, the powder room had a green toilet and a sink to match. They all needed to go. We chose to work on this project next because it was a simple project and because when we have friends over, that’s the bathroom they use. Why not make something pretty for our guests? Before was actually a little creepy once you’re in the room with the door closed. 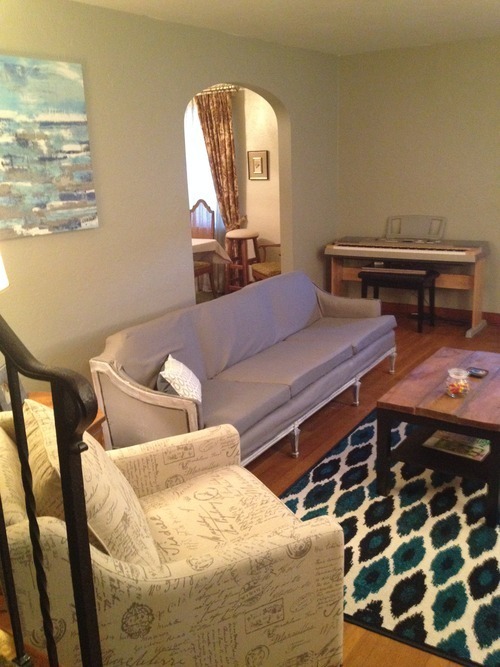 This was a pretty easy room to redo. 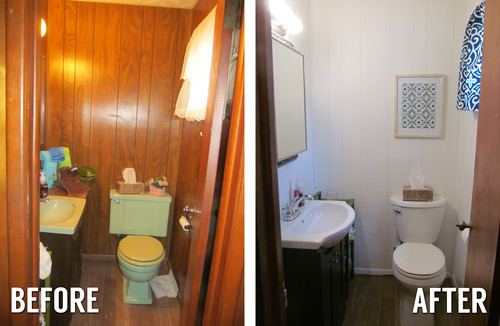 We removed the toilet and sink to get to the wood paneling and paint it white. So much brighter! It took a couple coats to cover. 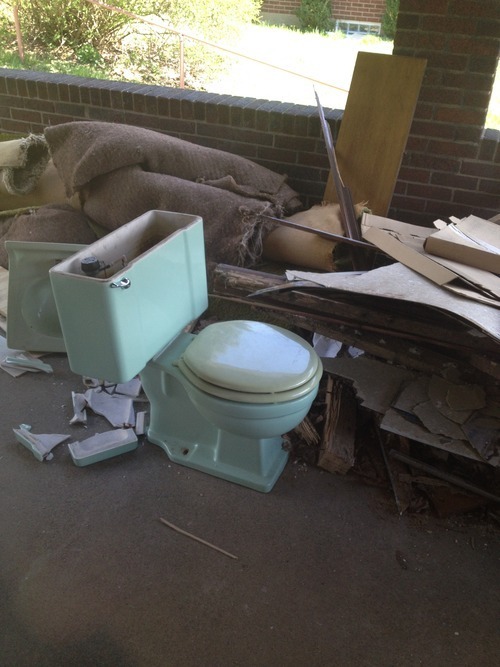 Goodbye to the green toilet! Then we installed a nice, new, white toilet and a sleek new sink. The only issue we had was with the toilet pipe. It was too rusted to put a new toilet in, so we had to have a plumber fix it before we could put the new one in. Other than that, it was a pretty smooth, bump free project. We replaced the lighting fixture as well with something sleeker. 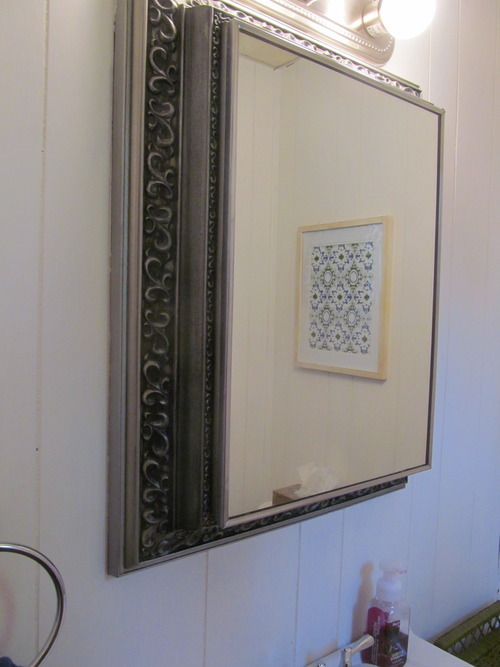 We kept the mirror that was previously in there. I loved the great details on it. 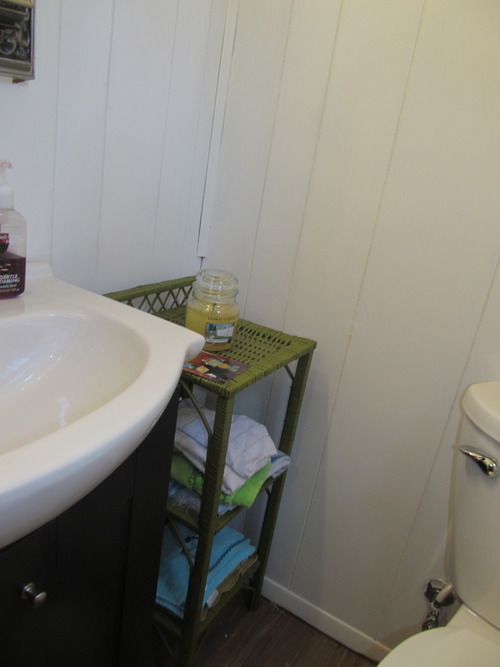 In addition to the mirror, we were also able to reuse this little shelf for towels and things. 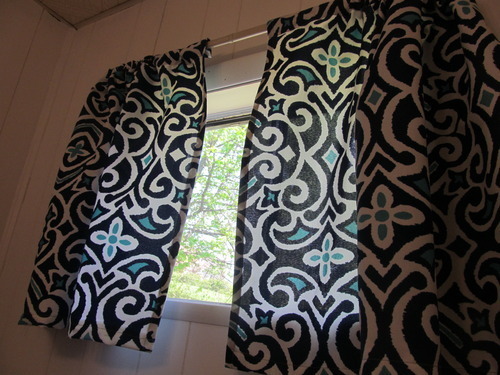 We found a great picture for the wall for only $10 at Marshalls to bring some color in and I made some curtains with fabric found at Joann Fabrics to coordinate. Over all it was super easy and had we been a little more prepared, we could have had the whole room done in one day. A 24 hour room makeover would be a welcomed thing. This room was great practice for the main bathroom, which is coming up next!